SodaStream is one of the fastest growing ways people enhance the taste of their carbonated water. Rather than relying on artificial flavors and loads of sugar, SodaStream flavors generally use all-natural materials. If they use sweeteners, they have a tendency to use artificial sweeteners rather than pure sugar. While these qualities tend to be the same across different brands, the actual flavors from one to the next differ. On top of that, many different brands even go the extra mile further enriching their flavor with vitamins, antioxidants, and other health-boosting additives. In this list, we will show you the 5 best SodaStream flavors on the market, highlighting what makes each one different. Stur is an interesting SodaStream flavor brand because it started as a humble attempt of one father-to-be to make a healthy drink for his pregnant wife. Stur was the result of that search, and it is easily the best budget SodaStream flavor that we reviewed. Coming in a 5-pack that produces a total of 20 liters of servings, the Stur brand is on par with what you would expect. The biggest issue with the Stur is its taste. This is not to say that Stur tastes bad, but it does not taste as natural as some of the other flavors. Stur is also not as potent as some of the other flavors. This means you need to use more to get the same taste as more potent brands and reduces the value of Stur. The brand is still solid in terms of getting it just right. First, Stur provides the most variety of flavors with 8. The only potential issue is that all of the flavors are fruit-based, but there are many favorites like coconut water or blueberry. Each serving of Stur also has 100 percent of the daily required vitamin C that your body needs. Finally, Stur is made with 0g of sugar and has 0 calories per serving, making it great for those on a diet. H2wOw started like many other SodaStream flavors, as a healthy alternative to artificially flavored drinks sweetened with sugar. The founder, Alison Terone, wanted to give her children water that they would want to drink. Her solution has grown into the SodaStream flavor brand H2wOw and is a big part of why it is rated as our best healthy SodaStream flavor. When it comes to this brand, the flavor is not the most potent, but that is one of the few complaints about it. The flavor itself is made from natural extracts of ginger and lime. This actually goes for all 5 of the different flavors, giving H2wOw the second largest variety that we reviewed. It is worth noting that all of the flavors are fruit-based, and does not include a coconut variety. 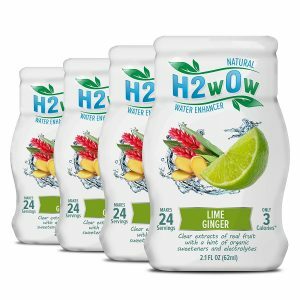 On top of the solid flavor, H2wOw also provides a decent value too. While it is not the least expensive SodaStream flavor we saw, it is still reasonably priced. Even better, H2wOw comes in a 4-pack that makes up to 20 liters of servings. Finally, H2wOw is enriched with electrolytes and contains only 3 calories per serving. This makes it a great alternative to sugary drinks post-workout. It also goes great as a mixer for more adult beverages. 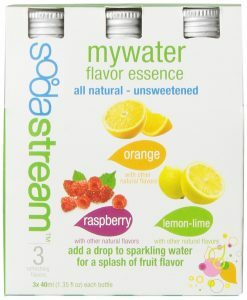 MyWater is not actually a company but is a specific type of flavor within the actual SodaStream brand. This gives it some unique advantages, but the biggest has to be that it was made with the SodaStream product in mind. That said, the MyWater brand of SodaStream flavoring is definitely a little bit more niche than some of the other products on our list. Of course, coming from the parent company itself, MyWater can afford to be. Easily one of the best things about the MyWater brand is that it aims to provide an overall pleasant experience. The first way it does this is by offering a variety of flavors within its 3-pack. 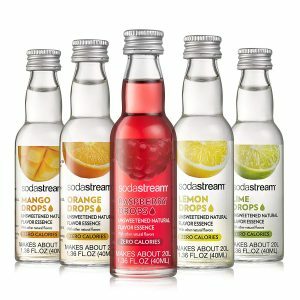 While every brand offers numerous flavors, SodaStream is surprisingly one of the few which sells multiple flavors in a single package. Like most of the other brands, the MyWater flavors provide a total of 20 liters of servings. While the brand association might provide you some comfort, it also has a tendency to increase the price. Like with all brand names, the prestige of the SodaStream name puts these flavors in a different price category. One issue that might surprise you is that customers report the flavor a bit lackluster and not as potent as they thought it would be. SodaStream makes another appearance on our list, but this time it is for “cola” flavors. This is perfect for people who are just starting to drink SodaStream products. Often, people start drinking SodaStream to help them stop drinking sugary “colas.” By providing a similar flavor, people can more easily transition from drinking sugar to drinking a healthier alternative. That said, SodaStream once again puts its literal stamp on the flavors with a bigger price tag than many other brands. Of course, this SodaStream flavor over all the others is likely to earn that increased price. Specifically, this SodaStream flavor is the most potent out of all those reviewed. However, some of the customers reported this line of flavors as being a bit too sweet for their taste. This variety of SodaStream flavor also has caffeine as well as artificial flavors. Beyond the cost and sweetness, there are not many flaws with this SodaStream flavor. This brand does come in a variety 4-pack giving you different types of cola flavors to choose from. Perhaps the best thing about the Diet Fountain variety is that it actually provides more servings than any other on our list at 36 liters. That is more than 50 percent more than the standard 20 liters. Our final flavor is another from the parent company, and this time the approach is explicitly minimal. With the Fruit Drops variety, you will not have to worry about any artificial flavors or sweeteners. This variety also does not contain caffeine or any preservatives making it the “purest” variety that we found. Finally, the Fruit Drops variety does not have any calories or grams of sugar per serving. This seems like it would be great, but this flavor is not the strongest nor the most natural tasting. Though, this variety of SodaStream flavor does not use artificial flavorings. In fact, people report having to use more of this variety to get the same potency than any other. This means that even though the Fruit Drops is the least expensive brand from SodaStream, it is not the best value. That said, you are not getting a bad deal either. This product comes in a 5-pack that features 5 different flavors. Altogether, this provides enough flavoring for 20 liters of servings. Though, the glass bottle packaging might be another problem as this makes it more difficult to precisely measure out the flavoring. As we can see, there are a lot of things that most SodaStream flavors do well. Most of them supply a lot of servings and are made from natural ingredients. Of course, many of them have issues with the potency of the flavor or the flavor not tasting completely natural. Still, which is the best SodaStream flavor for you will likely depend on what you are looking for. 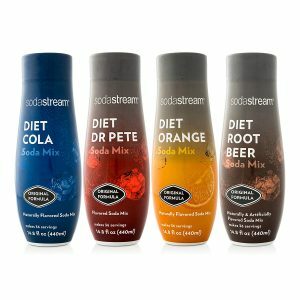 If you are looking to replace your sodas with a healthier alternative, then the SodaStream Diet Fountain Sparkling Drink Mix is probably the best option for you. The flavor is stronger than with most fruit-based flavors, though it can be a bit sweet to some. It is also more expensive than most flavors, but it also provides the most servings too. 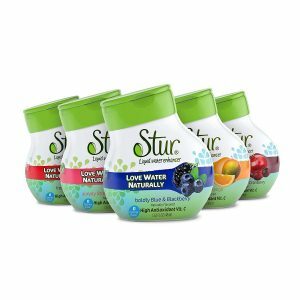 Of course, if you are more interested in quantity over quality, the Stur Natural Flavored Water Enhancer is a better option. While it has a slightly artificial flavor, the Stur SodaStream flavor is the least expensive mix that we reviewed. On top of that, the Sture brand also comes in the widest variety of flavors–even if they are not the strongest potency.